I just love the Beaux Arts architecture. The information center behind us was the original elephant house, built in 1911. Here’s a bit of trivia about The Boy – he was born in The Bronx. At the time, we lived in Westchester County, about 20 minutes north of the hospital where my OB delivered babies. He thinks it gives him a cool street cred. Which is negated every Friday when he skips off happily to Webmaster Club, toting his very own Ninja-shaped thumb drive. But a drive south to the Bronx Zoo always elicits smiles and memories when we pass the exit for the hospital where our lives changed forever. 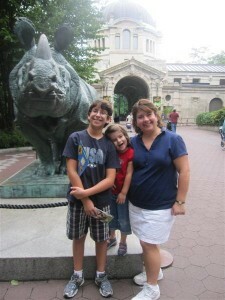 We’ve been to the Bronx Zoo many times, and never knew it was the world’s largest urban zoo! 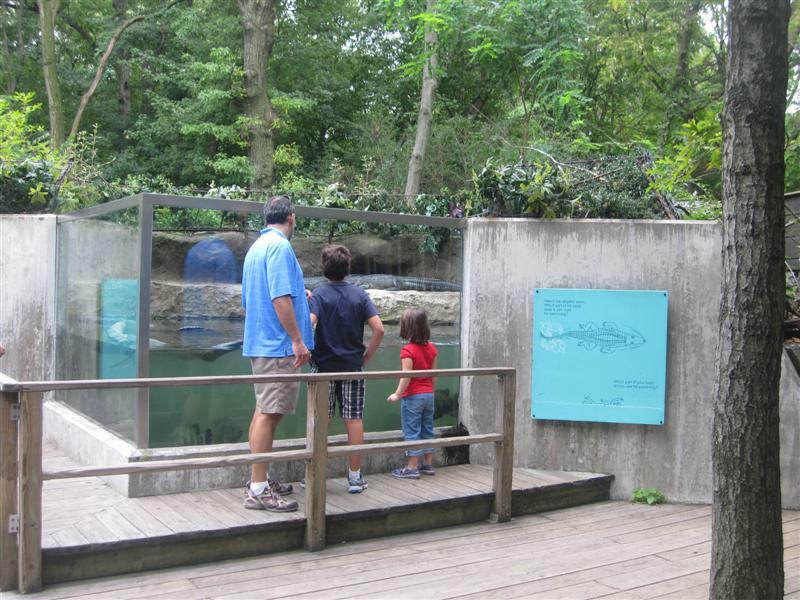 Zoos, especially expansive facilities like this one, are a treat for all ages. With two kids of opposite genders, seven years apart, it’s not always easy finding an outing everyone can agree on. Plus, the Bronx Zoo is open year-round, which makes it an ideal day trip for us in the spring and fall when other seasonal attractions are closed. The outdoor animal habitats are huge, which make me feel like they’re living a decent life despite the whole “captivity” thing. In fact, the Congo Gorilla Forest is the world’s largest gorilla habitat. The size also gives them plenty of distant corners in which to hide, leaving you to explain to your anxious kids why they won’t be able to see the giraffes today. For guaranteed animal sightings, head to the indoor exhibits, where you get an up-close look at smaller creatures behind glass. 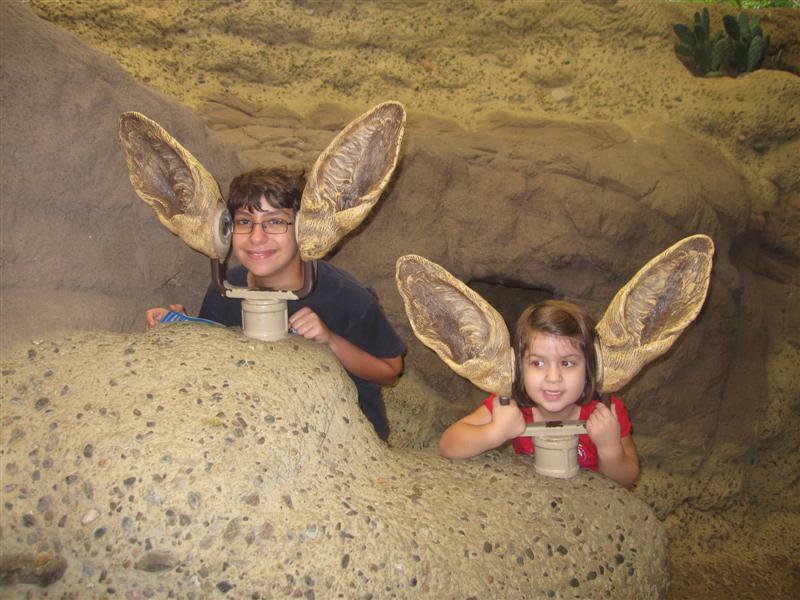 Our favorite spaces to see animals include JungleWorld, the Sea Lion Pool, and the World of Birds. Indoors and outdoors, you’ll find a nice variety of simple interactive elements at the exhibits. Lots of buttons, dials, and other touchy-feely devices for little hands to explore when the animals aren’t putting on a show. The Children’s Zoo, in particular, is a three-acre setting full of activities. What elevates the attraction status of the Bronx Zoo are the extra rides, especially the Wild Asia Monorail and The Bug Carousel. 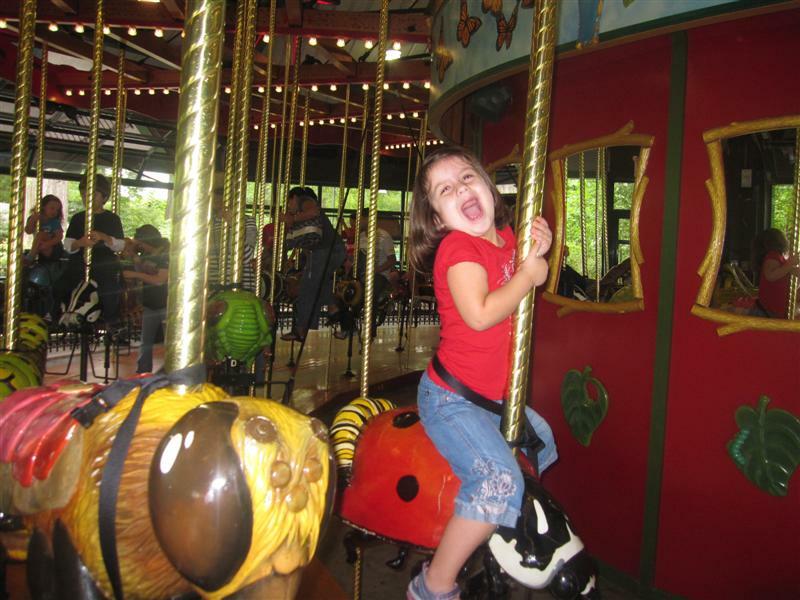 The Girl is something of a merry-go-round expert (we’ve even been on the world’s only solar-powered carousel), and she loves this one because of the choice of insects to ride on. No namby-pamby painted horses for her. The Wild Asia Monorail brings you to (technically, over) exhibits you can’t access on foot, to see animals like the Asian leopards and elephants. This, like the other rides, cost an additional fee, but it’s worth the “Total Experience Ticket” if your kids want to do and see more than the traditional animal exhibits. 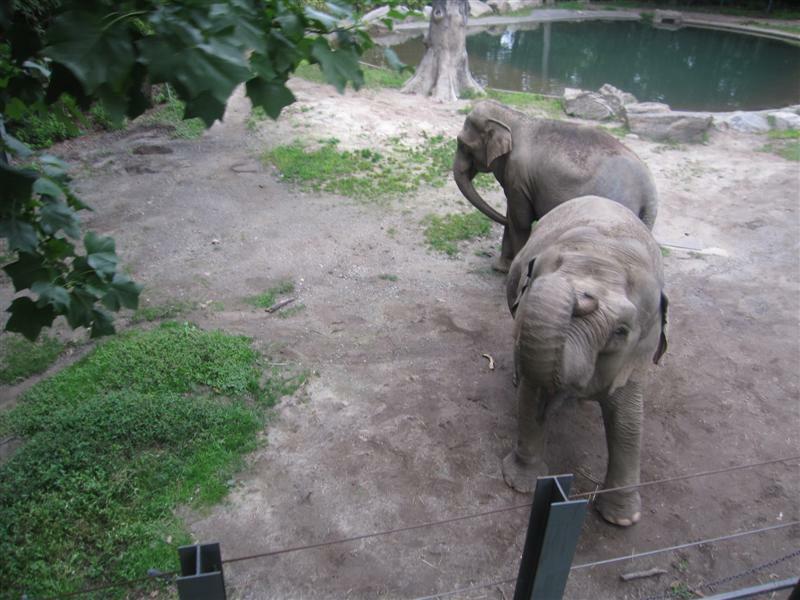 The elephants came over to the monorail to greet us! The Bronx Zoo is one of the best zoos we’ve visited anywhere. However, the immensity of it – which qualifies it as a “world’s largest” – means a LOT of walking. You’re not going to cover a lot of ground if your kids no longer want to be in a stroller, but are still toddling. And if you DO still use a stroller, it’s not always smooth sailing. You can’t bring them into the indoor exhibits, so you have to park them and get the kids in and out repeatedly. Plus, the hilly landscape means a lot of pushing uphill, and some stairways to manuever. I’d be intimidated by somebody who hails from the Bronx. That’s definitely street cred worthy. On the other hand, I’m even more intimidated by somebody who can ride insects without getting creeped out. I think what I’m saying here is, I’m easily intimidated. The zoo looks like lots of fun! Love the elephant photo. Looks like you’re about to get sprayed. Great article with great pictures. I love going to the Zoo with children. Their reaction to animals is incredible. One of the most beautiful Zoos I have ever visited was a San Diego Zoo. Thanks for posting! I happened by a pic of the tallest Tree House in BC and…well, I have an Android phone that takes pics of something and tells you what it is. So, I took a pic of the tree house and it had your url on it at the bottom. I loved all you wrote so I kept on reading. Unfortunately I didn’t have a whole bunch of time so I stopped to email you. Alright, here come the pathetic thing. I’ve never really travelled except when I went to Hawaii a few yrs ago…alone. Long story short, the two women that were to go with me dropped out and I just couldn’t give up the tickets. Sadly, it was Valentine’s Day the next day and I found myself in a restaurant for dinner full of couples. Wawawa. Ok, here’s what I was gonna say: I’ve dreamed of travelling but as the yrs go by, I get poorer and poorer! I’m 63, divorced and still have that same wanting to be in awe of something other than pictures and on tv. I could just cry when I see something, like a huge waterfall, that I will never see. I do online jigsaw puzzles and am always on the lookout for outdoor pics like the tree house. By the way it made a terrific puzzle. Do you have pictures of where you’ve been? I could possibly live, well travel, vicariously through you and your family’s adventures. Thanks and have a wonderful time travelling! Thanks for your note, Marie! The great thing about the kind of travel we do — regional road trips — is that it’s relatively affordable. We didn’t get to see that tree house either; that post was written by one of our guest contributors! I like to dream big, though, and hope to get to Australia some day! Thanks, Alex! The Sea Lions there really can ham it up when they want to! Welcome to New York!